American Mars lander. The Mars Polar Lander had the mission of studying Martian volatiles (frozen water and carbon dioxide) and climate history. The Martian polar regions were the best places to conduct these studies. No telemetry was received from the lander from just prior to its reentry on 3 December 1999. The investigation team concluded that just 40 m above the Martian surface the deployment of the landing legs was interpreted by the spacecraft as touchdown on the surface, shutting down the engines. The fiasco led to major changes in future planetary probes, including adequate funding and telemetry all the way to the surface. Mars lander operated by NASA, USA. Launched 1999. Status: Operational 1999. First Launch: 1999-01-03. Last Launch: 1999-01-03. Number: 1 . Gross mass: 576 kg (1,269 lb). Height: 3.60 m (11.80 ft). Span: 3.50 m (11.40 ft). The trajectory employed only allowed a south polar landing. The Mars Polar Lander was part of the Mars Surveyor program, managed by the Jet Propulsion Lab in Pasadena. The MPL was built by Lockheed Martin Astronautics/Denver. A target landing sector for the lander extended from 73 to 78 degrees south latitude, and 170 to 230 degrees west longitude. The final landing site would be selected in June of 1999, using new data obtained by the Mars Global Surveyor spacecraft. Attached to the cruise stage were two Deep Space 2 Mars Microprobes, penetrators which would separate and bury themselves into the Martian surface a 100 km away from the main landing point. At the end of the scheduled mission, the lander would be frozen in place for more than one Earth year during the southern polar night season. Total spacecraft mass was 615 kg. Mass of the Mars Polar Lander, less the penetrators was 576 kg, of which: Lander: 290 kg ; Propellant: 64 kg; Cruise Stage: 82 kg; Aeroshell & Heat Shield: 140 kg. Science payloads included: Mars Descent Imager (MARDI); Light Detection and Ranging (LIDAR) MVACS; Stereo Surface Imager (SSI); Robotic Arm (RA) / Robotic Arm Camera (RAC); Meteorological Package (MET); Thermal and Evolved Gas Analyzer (TEGA). Mars landing was planned for December 3, 1999, with the end of the primary mission by February 29, 2000. All contact with the spacecraft was lost at the point of separation of the lander and multiprobes. Subsequent investigations pointed to shortcomings in project management and preflight testing, with the result that future 'faster, better, cheaper' NASA missions would be not quite so 'cheap'. Three days before landing, one or two final trajectory correction maneuvers would be performed to steer the lander as close as possible to its final landing site. The lander's error ellipse was expected to be 120 km long by 10 km wide. Ten minutes before landing, the lander's cruise stage would be jettisoned and the lander's heat shield would be oriented for atmospheric entry. For a successful landing, the lander had to intercept the atmosphere within 1 degree of its nominal entry angle. Too shallow an entry angle would cause the lander to skip off the atmosphere back into space. Too steep an entry angle would cause the lander to burn up in the atmosphere. Prior to entry, two 3.5 kg penetrators provided by JPL's New Millennium Deep Space Project would be released. The probes would enter the atmosphere and impact the Martian surface approximately 100 km up-range of the lander. Each probe would consist of a forebody which would penetrate up to meter into the Martian soil, and an aft body which would remain on the surface. The forebody contained acceleration sensors and a water experiment which would collect a small quantity of soil and heat it to release water. 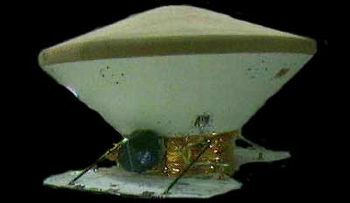 The aft body contained electronics and an antenna to be used for one-way communication with the Mars Global Surveyor Orbiter. The probes were powered by non-rechargeable batteries and were expected to survive for two days. Meanwhile, the lander would begin its encounter with the Martian atmosphere approximately 4 minutes and 33 seconds before landing. 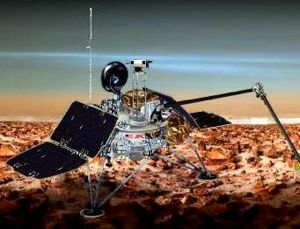 During this period, the lander would use the friction produced by the Martian atmosphere to decelerate rapidly from its initial velocity of 6.8 km per second. The temperature of the lander's heat shield would increase to 1650 deg C and it would experience peak G forces of 12 times Earth's gravity. Approximately two minutes before landing, the lander's parachute would be deployed. By this time, the lander would be traveling at a speed of 493 meters per second and would be 7.3 km above the Martian surface. Ten seconds after the parachute opens, the Mars Descent Imager (MARDI) would begin taking images. The first image would be acquired 0.3 seconds before the heat-shield was jettisoned. MARDI would take approximately 10 images of the Martian surface at increasing resolution as the lander descends. The fields of view of the MARDI images would decrease from 8 km across to 9 meters across just before landing. Approximately 100 seconds before landing, the lander legs would be extended and a landing radar would be activated to determine the distance to the Martian surface. 1.4 km above the surface, the lander's parachute and backshell would be separated and the lander would use a set of thrusters to perform a 35-second controlled descent to the Martian surface. Inertial gyros and accelerometers would be used to orient the lander during its final descent. The lander would land facing the best direction for its solar panels to generate power once it lands. The lander would not be in radio contact with the Earth at any point during the entry, descent and landing phase of the mission. The lander would unfold its solar panels two minutes after landing and begin pointing its medium-gain radio antenna at Earth five minutes after landing; the MVACS Meteorology mast would be deployed a short time later. The lander would establish a two-way Earth-to-Mars radio link approximately 20 minutes after landing. During its first 20-minute communication session, it would transmit critical information on the spacecraft's health, initial meteorological data, and possibly some compressed images acquired by the MVACS SSI camera prior to deployment. During the lander's first day on the Martian surface, it would also communicate with the Mars Climate Orbiter (MCO) via a UHF radio link that would be established when the orbiter passed over the landing site. MCO's polar orbit would enable approximately four orbiter passes each day in which lander data could be relayed to Earth and commands from Earth could be relayed to the lander. The MCO relay would be the lander's primary communications link during the mission. The Mars Global Surveyor Orbiter and the lander's medium gain antenna would also be available as backups. During the lander's first day on the surface, it would begin relaying the MARDI descent images back to Earth and begin surveying its new environment. Some of the most anticipated data that would be acquired during the first days of the mission would be a scan of the horizon by the MVACS Surface Stereo Imager (SSI). The SSI was nearly identical to the IMP camera that flew on Mars Pathfinder, and would be capable of providing stereo color panoramas of the landing site. Additionally, the SSI would acquire quantitative data relating to clouds and water vapor in the Martian atmosphere. During the third day of the mission, the MVACS Robotic Arm would acquire its first samples of Martian soil. The robotic arm was about two meters long and had approximately the same strength as a human arm. The arm included a probe to measure the temperature of surface and subsurface soil, and a Robotic Arm Camera which could take close-up images of the arm's workspace and soil samples. Soil samples acquired by the Robotic Arm would be delivered to the MVACS Thermal And Evolved Gas Analyzer (TEGA) for analysis. The TEGA sifted the soil into one of eight small ovens. As the samples were heated, the quantities of water vapor and carbon dioxide released were measured. The TEGA data could be used to determine the concentrations of water ice, adsorbed water and carbon dioxide, hydrated minerals and carbonates in the soil. These measurements would place valuable constraints on the understanding of the distribution and behavior of volatiles on Mars, as well as give clues to Mars' climate history. Robotic Arm Camera Image. The MVACS Robotic Arm Camera (RAC) would provide images of the Martian surface and the Mars Polar Lander from a unique perspective. At its closest focus, the RAC could obtain images with a resolution of 23 microns per pixel, which was higher resolution than the unaided human eye. During its three month surface mission, the Mars Polar Lander instruments would measure both daily and seasonal variations in atmospheric properties. The LIDAR instrument would make the first such measurements of the Martian atmosphere. The MVACS Meteorology Package's Tunable Diode Laser (TDL) Spectrometer would make the first accurate in situ measurements of the concentration of water vapor in the Martian atmosphere. The MVACS MET sensors would make the first measurements of temperature, pressure and winds in the Martian southern hemisphere. The Mars Microphone would make the first recordings of the sounds of Mars. The microphone would be capable of detecting sounds generated by the lander and its instruments, as well as natural sound in the Martian environment. Microphone data would typically be acquired for 15 seconds each day, with the possibility of longer listening periods to search for unusual or intermittent sounds. One of the major goals of the MVACS investigation was to search for Martian ground ice. Subsurface ice was common at high-latitudes on Earth. Models for the behavior of water on Mars predict that ice could be stable throughout the year as close as 20 cm below the surface at the Mars Polar Lander's landing latitude. During the course of the mission, MVACS robotic arm would scoop up soil and dig a trench up to 50 cm deep. The trench walls would be examined by the Robotic Arm Camera and samples from inside the trench would be analyzed for water ice content by the MVACS TEGA. The discovery of ground ice would be important for Mars science, as well for future human exploration of Mars. The longevity of the Mars Polar Lander would be limited by its ability to withstand the rigors of the changing polar environment. The lander would arrive during the late Martian spring season in the southern hemisphere, when the sun would be above the horizon throughout the day, and surface temperatures would vary between -80 deg C and -20 deg C. Towards the end of the summer season, the sun would dip closer and closer to the horizon, making it colder, and more difficult for the lander to generate solar power. March 1, 2000, would mark the first true sunset at the Mars Polar Lander landing site. It was not expected that the lander would be able to collect much useful scientific data after this point. After it dies, the lander would spend the next year frozen in the Martian south seasonal carbon dioxide polar cap at a temperature of -125 deg C. There was a faint possibility that the lander would revive itself when the spring sun returns in 2001. The Mars Surveyor '98 program is comprised of two spacecraft launched separately, the Mars Climate Orbiter (formerly the Mars Surveyor '98 Orbiter) and the Mars Polar Lander (formerly the Mars Surveyor '98 Lander). The two missions were designed to study the Martian weather, climate, and water and carbon dioxide budget, in order to understand the reservoirs, behavior, and atmospheric role of volatiles and to search for evidence of long-term and episodic climate changes. The last telemetry from Mars Polar Lander was sent just prior to atmospheric entry on 3 December 1999. No further signals have been received from the lander, the cause of this loss of communication is not known. The Mars Polar Lander was to touch down on the southern polar layered terrain, between 73 S and 76 S, less than 1000 km from the south pole, near the edge of the carbon dioxide ice cap in Mars' late southern spring. The terrain appears to be composed of alternating layers of clean and dust-laden ice, and may represent a long-term record of the climate, as well as an important volatile reservoir. The mission had as its primary science objectives to: 1) record local meteorological conditions near the martian south pole, including temperature, pressure, humidity, wind, surface frost, ground ice evolution, ice fogs, haze, and suspended dust, 2) analyze samples of the polar deposits for volatiles, particularly water and carbon dioxide, 3) dig trenches and image the interior to look for seasonal layers and analyze soil samples for water, ice, hydrates, and other aqueously deposited minerals, 4) image the regional and immediate landing site surroundings for evidence of climate changes and seasonal cycles, and 5) obtain multi-spectral images of local regolith to determine soil types and composition. These goals were to be accomplished using a number of scientific instruments, including a Mars Volatiles and Climate Surveyor (MVACS) instrument package which was comprised of a robotic arm and attached camera, mast-mounted surface stereo imager and meteorology package, and a gas analyzer. In addition, a Mars Descent Imager (MARDI) was planned to capture regional views from parachute deployment at about 8 km altitude down to the landing. The Russian Space Agency provided a laser ranger (LIDAR) package for the lander, which would be used to measure dust and haze in the Martian atmosphere. A miniature microphone was also be on board to record sounds on Mars. Attached to the lander spacecraft were a pair of small probes, the Deep Space 2 Mars Microprobes, which were to be deployed to fall and penetrate beneath the martian surface when the spacecraft reached Mars. The Mars Polar Lander consists of a hexagonal base composed of aluminum honeycomb with composite graphite epoxy face sheets supported on three aluminum landing legs. The lander stands 1.06 m tall and approximately 3.6 m wide. The launch mass of the spacecraft is approximately 583 kg, including 64 kg of fuel, an 82 kg cruise stage, a 140 kg aeroshell/heatshield, and the two 3.5 kg microprobes. A thermally regulated interior component deck holds temperature sensitive electronic components and batteries and the thermal control system. Two solar panels extend out from opposite sides of the base. Mounted on top of the base are the robotic arm, the stereo imager and mast, a UHF antenna, the LIDAR, the MVACS electronics, the meteorology mast and the medium gain dish antenna. The MARDI is mounted at the base of the lander, and the propellant tanks are affixed to the sides. During cruise, the lander is attached to the cruise stage and enclosed in the 2.4 meter diameter aeroshell. The spacecraft was three-axis stabilized during cruise using star cameras and sun sensors in conjunction with inertial measurement units. Four hydrazine cruise reaction engine modules, each consisting of one 5-lbf trajectory correction maneuver thruster and one canted 1-lbf reaction control system thruster, provided attitude control. The descent and landing propulsion system consists of three groups of four pulse modulated 266 N hydrazine engines. Control and knowledge for descent and landing is provided by a 4 beam doppler radar system and an AACS subsystem. The hydrazine is stored in two diaphragm tanks with a total capacity of 64 kg for both cruise and descent systems. Communications between Earth and the spacecraft during cruise to Mars were via X-band using two solid state power amplifiers and a fixed medium gain antenna mounted on the cruise stage and backed up by a receive-only low gain antenna. During surface operations communications (downlink and uplink) would be via the UHF antenna on the lander to the Mars Climate Surveyor orbiter, which will function as a relay to Earth. Eight to ten relay passes over the lander would have been available from the orbiter each day, but the number of communications sessions would be limited by power demands. Uplink only communications to Earth were to be provided by the medium gain DTE (direct to Earth) 2-axis articulated antenna. Power was provided during cruise phase by two gallium arsenide solar array wings with a total area of 3.1 square meters attached to the cruise stage. After landing, two gallium arsenide solar array wings with a total area of 2.9 square meters would have been deployed. Power is stored in 16 amp-hr nickel-hydride common pressure vessel batteries for peak load operations and night time heating. The payload is allocated 25 W of continuous power when operating. Mars Polar Lander and the attached Deep Space 2 probes were launched on a Delta 7425 (a Delta II Lite launch vehicle with four strap-on solid-rocket boosters and a Star 48 (PAM-D) third stage) which placed them into a low-Earth parking orbit. The third stage fired for 88 seconds at 20:57 UT 3 January 1999 to put the spacecraft into a Mars transfer trajectory and the spacecraft and third stage separated at 21:03 UT. Trajectory correction maneuvers were performed on 21 January, 15 March, 1 September, 30 October, and 30 November 1999. After an 11 month hyperbolic transfer cruise, the Mars Polar Lander reached Mars on 3 December 1999. A final 30 minute tracking session begins at approximately 12:45 UT (7:45 a.m. EST) and was used to determine if a final thruster correction was necessary. Final contact to retrieve data on the status of the propulsion system was made from approximately 19:45 UT to 20:00 UT. At approximately 20:04, 6 minutes before atmospheric entry, an 80 second thruster firing was to turn the craft to its entry orientation. The Star 48 upper cruise stage was to be jettisoned at about 20:05 UT, and about 18 seconds later the microprobes were to be dropped from the cruise stage into the martian atmosphere (also targeted at the southern polar layered terrain). The lander was to make a direct entry into Mars' atmosphere at 6.8 km/s at about 20:10 UT (3:10 p.m. EST). Due to lack of communication, it is not known at this time whether all these steps following final contact were executed, nor whether any of the descent plan described below took place as designed. Initial deceleration would be simple aerobraking using the 2.4 meter ablation heat shield. The maximum time from atmospheric entry to landing would be 4 minutes 33 seconds. The inertial measurement unit would estimate the velocity throughout the entry and descent phase and the thrusters would keep the craft aligned. At an altitude of about 7.3 km at 500 meters per second the parachute would be deployed by a mortar followed by heat shield separation. Just before heat shield separation, the descent imager (MARDI) would turn on. The landing legs would be deployed 70 to 100 seconds before landing and the descent engines warmed up with short pulses. Then the parachute would be jettisoned and the descent engines fired, regulated by the spacecraft control system and the Doppler radar. The backshell would separate from the lander at about 1.4 km altitude at 80 m/s and the descent engines turned on to slow the descent and turn the flight path to vertical. At 12 meters altitude the 2.4 m/s terminal descent phase was to begin. Engine shutoff would occur when one of the landing legs touched the ground. The horizontal landing velocity would be less than 2.4 m/s vertical and 1 m/s horizontal. The orientation of the lander is controlled by the AACS subsystem to maximize solar array efficiency and minimize obstruction of the DTE antenna. The lander would have touched down at approximately 20:15 UT Earth received time (3:15 p.m. EST) in the late southern spring season, during which the Sun will always be above the horizon at the landing site. The other times listed above are also Earth received times, light travel time from Mars at that point was approximately 14 minutes. Immediately after landing the solar panels were to be deployed. The first signal from the lander was to reach Earth at 20:39 UT (3:39 p.m. EST), but was never received. This was to be the start of a 45 minute communications session. After this session the lander was to recharge its batteries for about 6 hours. On 4 December at 04:30 UT (11:30 p.m. EST December 3) a communications session was to begin which would have lasted about 2 1/4 hours. This session would have included images, including pictures from the Mars Descent Imager, but again no transmission was received. The first sounds from the Mars Microphone were to be released as early as 4 December and the first robot arm dig occur on 7 December. Science experiments would continue over the 90 day primary mission, with an extended mission to follow based on lander performance. The Mars Surveyor '98 program spacecraft development cost 193.1 million dollars. Launch costs are estimated at 91.7 million dollars and mission operations at 42.8 million dollars. The Mars Polar Lander is part of NASA's 10-year Mars Surveyor Program, which will feature launches every 26 months when the Earth and Mars are favorably aligned. More at: Mars Polar Lander. DS2 Microprobe Deep Space 2 Microprobes were penetrators which would impact the Martian surface separately from the Mars Polar Lander and return data on subsurface conditions from widely spaced points. The two penetrators were dubbed Scott and Amundsen. However no further communications were ever received from the Polar Lander or the Microprobes after arrival on the Martian surface. Family: Mars lander. Country: USA. Projects: Mars. Launch Sites: Cape Canaveral, Cape Canaveral LC17B. Agency: JPL, NASA, Martin. Bibliography: 2, 3949, 3950, 407, 6688, 12810. 1999 December 3 - . Contact lost with Mars Polar Lander - . Nation: USA. Spacecraft: Mars Polar Lander. Mars landing was planned for December 3, 1999, with the end of the primary mission by February 29, 2000. All contact with the spacecraft was lost at the point of separation of the lander and multiprobes. Subsequent investigations pointed to shortcomings in project management and preflight testing, with the result that future 'faster, better, cheaper' NASA missions would be not quite so 'cheap'.